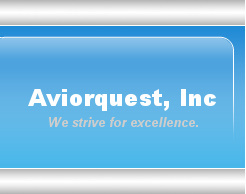 Welcome to Aviorquest, Inc. We provide consulting services and solutions in the field of application software for businesses of all sizes in a wide range of industries. Our certified developers focus on understanding your needs and develop solutions which will help you stay ahead of the competition and bring business success. Mission statement: We strive to provide solutions of the highest quality to critical applications; Stand by our resources and services we offer. Treat our partners, clients and employees with dignity and respect.